This week I did a radio interview (click link to listen) on KPCC with Kevin Kelly on lifelogging and the quantified self. Trying to do a quick primer on these subjects to an audience that isn’t aware of them can be challenging to do in a short period of time. It’s a bit of a shame that in covering these topics over the years they always seem to trigger negative aspects associated with them. Privacy is usually the most common issue that comes up and that surely has implications. Both Kevin and I provided some thoughts on that in the interview. 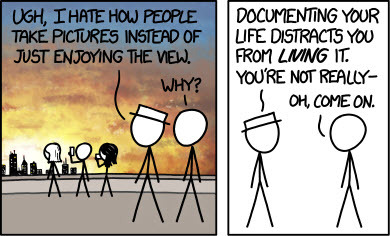 Other common criticisms are that by spending so much time lifelogging, you’re take away from living life or just enjoying the moment. And yet others feel that people who do this are narcissists. The scale between healthy to extreme ways to lifelog is something to be decided by the person who is doing it. Ultimately they determine what level they are comfortable with which makes them happy. 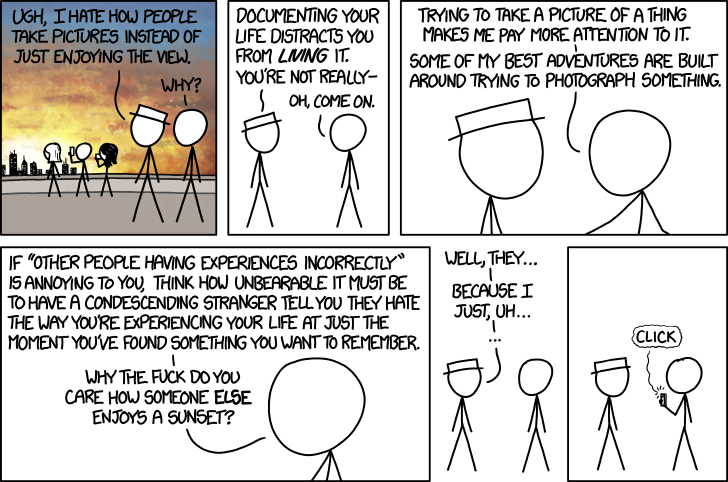 This XKCD comic shared by Ernesto Ramirez is a perfect rebuttal for critics of lifeloggers. Learning how to use this technology may require 4-5 years of deliberate instruction when we are young to learn how to deal with all of these kinds of choices and life online. Maybe it’s something that we don’t do naturally we can’t just hang around people doing it we may actually have to have a formal training just like we learn how to read and write. Perhaps we’ll see classes that will cover this topic in the future like the course I wrote about in 2009 at the University of Edinburgh on digital cultures. In the meantime, those of us that are lifelogging need to continue to be ambassadors and educators on the topic.